The preoperative lymph node status is critical for tailoring optimal treatments for esophageal squamous cell carcinoma (ESCC). 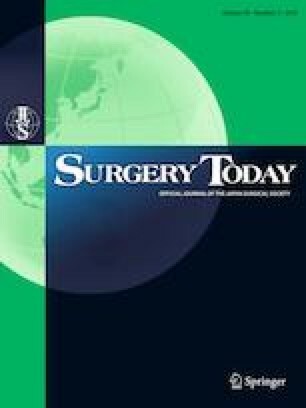 This study aimed to evaluate the prognostic impact of a diagnostic criterion based solely on the short-axis diameters of lymph nodes depicted on computed tomography (CT) in ESCC patients undergoing upfront esophagectomy. We retrospectively reviewed 246 pT1b–T3 ESCC patients undergoing upfront esophagectomy. Clinically positive lymph node metastasis (cN+) was defined as nodes with a short-axis diameter of at least 8 mm on CT.
Ninety-three patients had a cN+ status according to this criterion. The overall and recurrence-free survival rates were significantly lower in the cN+ group than in the cN− group (P < 0.001). The overall survival rate was markedly lower in the “pN2/3 and cN+” group than in the other groups (vs. pN0: P < 0.001, vs. pN1: P = 0.002, vs. “pN2/3 and cN−”: P < 0.001). However, the overall survival rate of the “pN2/3 and cN−” group was similar to that of the pN0–1 groups. A multivariate analysis showed that cN+ (P = 0.002), major complications (P = 0.001), and pT3 (P = 0.021) were independently associated with a poor prognosis. A diagnostic criterion based solely on the short-axis diameters of lymph nodes depicted on CT was useful for stratifying the survival in ESCC patients.